Thousands of people are injured in trip or slip and falls involving stairs every year at businesses, retail locations, parking garages, apartment buildings and other locations that people ordinarily frequent. When there are obvious defects such as a broken or missing handrail, loose carpet or even a broken stair the owner may be liable for any injuries a victim sustains. This also may be true when poor lighting is a factor if bulbs are burned out revealing that the owner was not properly maintaining the premises. A very common problem on stairs occurs when carpet becomes worn down or wood starts to erode on the run part of the stair where the foot lands, making the trip up or down treacherous for users. Sometimes problems occur when wood and tile stairs are polished to a high shine that is slippery to navigate leaving many to struggle down the stairs without falling. There are also stairs that have uneven runs and risers that not only violate building codes, but make it easy to get your feet tangled up resulting in falls. Whether an owner has neglected to keep stairs in good repair, has violated code, or did not consider the risks when choosing a finish, they could be liable for injuries that occur. Of course, many trip or slip and falls on staircases can happen outdoors too, especially in areas of the country where snow and ice are prevalent. While an insurance company may say that the property owner is not responsible for the weather, and that users must exercise common sense to avoid falls on slippery stairs, that does not excuse an owner from taking precautions. If stairs are not designed and maintained to discourage the buildup of ice and you slip as a result, the owner may still be liable. If he or she did not apply an anti-slip surface or regularly apply salt to outdoor stairs subject to the elements and made no effort to warn patrons, compensation for injuries incurred may be due. If you are hurt after falling on a staircase while visiting a business or residence, you may be able to pursue compensation for your injuries. Trip or slips and falls on staircases can result in broken bones, strains and sprains, neck and head injuries that can result in medical bills, lost wages and pain and suffering, which may all be compensatable through a premise liability claim. 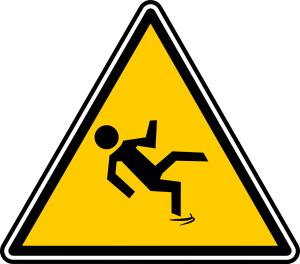 If you or a family member is hurt in slip and fall or trip and fall, contact the Davenport, Iowa premise liability attorneys of McDonald Woodward & Carlson PC for immediate assistance today at 563-355-6478.